I just squeezed in just before the deadline with this one. 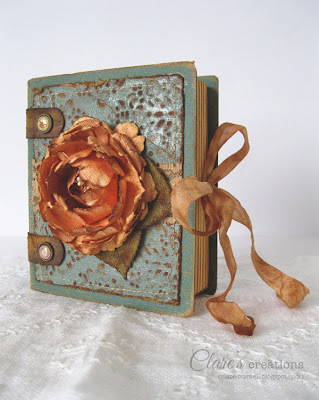 The Tim Holtz Tattered Floral Challenge was on my to-do list for a while now and I finally got around to it today. You know how much I love to make paper flowers and the Tattered Floral die is one of my all time favorites. You know I also like to make my flowers big and this one ended up being 3 1/2" wide and about an inch deep. 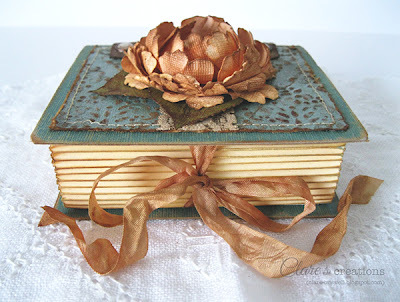 It's sitting on a faux book gift box I just made (more about that in another post). 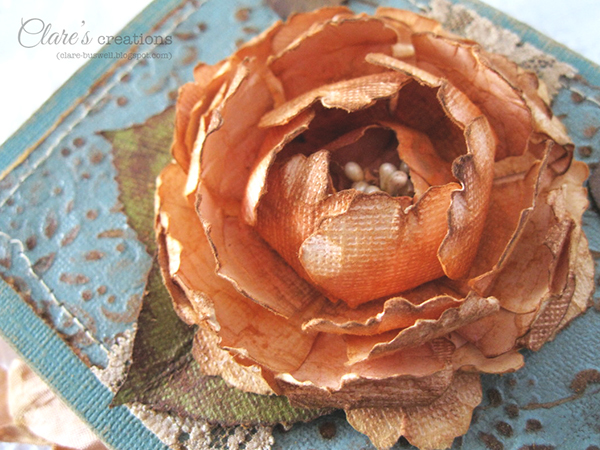 So I went for a full bodied, shabby flower and I added some stamens to the center. I used Core'dinations cardstock from the Super Assortments range to make the flower using several layers of the largest flower die and just a couple of the medium sized one. I did a lot of inking and blending with Victorian Velvet and Vintage Photo Distress ink and some shaping and cupping on a foam mat. To add some extra glow after that I used some blending chalks, some orange and yellow and added some subtle shading to the bases of the petals in the center layers. I also divided some of the larger petal layers (something that Core'dinations cardstock is perfect for), as in I split the actual paper. I go into more detail about this in this tutorial - Shabby Rose Tutorial. 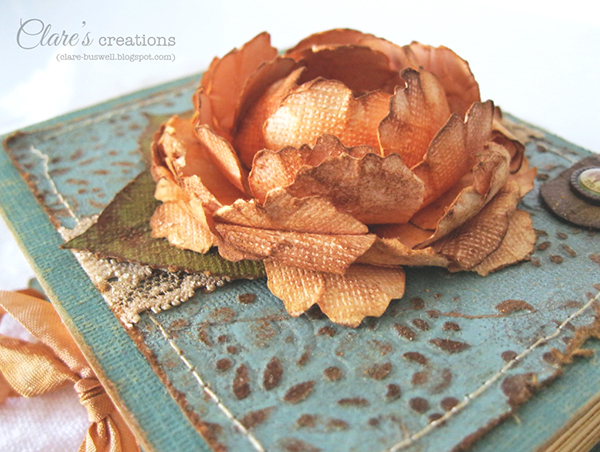 It makes the petals more textured and light, I just love the effect and it's perfect for a tattered flower! The leaves I cut by hand from Core'dinations cardstock and inked with Antique Linen and Vintage Photo Distress Inks. I'll be back really soon with another post to talk a bit more about this faux book I just made, I think it's one of my favorite creations for a long time! wow, that flower is absolutely amazing! OMG! unbelievable, stunning flower! 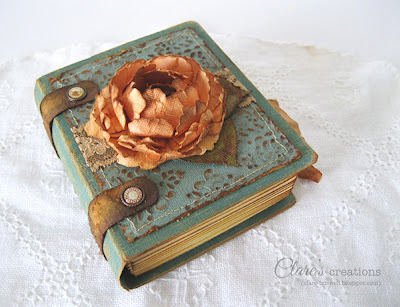 and love the details on the faux book. Wow , this is such a GORGEOUS project! LOVE IT!!!! Beautiful!!! I love your project! It is a winner in my book! !